Madrid is the capital and largest city in Spain. It's a popular travel destination for its excellent culture, great art scene, and impressive museums. There is also a vibrant nightlife scene with many great bars and restaurants. 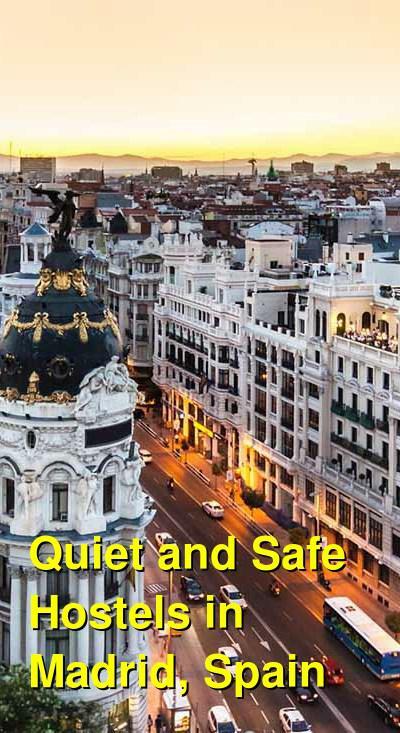 There are many great hostels and budget guesthouses in Madrid. Hostels range in style and atmosphere, but if you're looking for a quiet and safe place to stay, some of the best are listed below. A good hostel for independent or female travellers. Far Home Atocha is a nice option for budget travelers and backpackers who want a quiet and safe place to stay in the middle of Madrid. The hostel has private rooms, single rooms, and dorms available. Doubles and three bed privates are available and dorms sleep four, six, eight, or twelve people. Dorms include both co-ed and female only rooms. This hostel has a modern design with a patio terrace, a common area, and a conference room. All of the rooms are connected with wi-fi and those guests staying in dorms are given individual security lockers. Some private rooms have balconies and you can choose from either private or shared bathrooms depending on your budget. A filling buffet breakfast is also available every morning for an additional fee. This hostel is located on Calle Atocha. It's in Madrid's City Center and is very close to Plaza Mayor Square and Sol Square. It is a great place to relax after a busy day exploring the city. The staff are friendly and helpful and the rooms and facilities are kept very clean. There's a mellow atmosphere and you can be assured a good nights sleep after a fun day out on the town or a long travel day on the bus or train. A simple and affordable hostel in central Madrid. Another good and affordable option for travelers to Madrid is Alvaro Residencia. It's located right in the heart of the city and is a small and quaint place to stay with a relaxing vibe. There are seven rooms in total and each room has it's own television and air conditioning. Although the furnishings are simple and basic, there is a communal kitchen that guests can use to prepare their own meals. There is also a washing machine if you need to do some laundry. There is a relaxing common area where you can hang out with other guests. You can also enjoy free internet access in the common area. This hostel is conveniently located just a couple of minutes from the Tirso de Molina subway. It's also about five minutes from Plaza Mayor and the nearby museums, sights, and attractions. 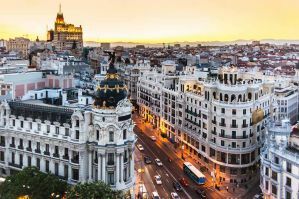 This is a popular area for its interesting restaurants, shops, and nightlife, and it is a good place to base yourself during your time in Madrid. If you're looking for a simple and affordable place to stay in the heart of Madrid, then Alvaro Residencia is a great option. A nice guesthouse for budget travellers. THC Bergantin Hostel is located in Puerta del Sol, which is right in the heart of Spain. It's a great location if you're hoping to visit many of the city's top landmarks and attractions. You can easily walk to many different places including the Prado Museum, the Thyessen-Bornemiza Museum, and the Art Centre of Reina Sofia. The guesthouse is also close to Plaza Mayor, the Royal Palace, the Real Theater, the Almudena Cathedral, and many other sights. Nearby you'll also find many bars and restaurants and the Sol Metro Station is just 200 meters away. This hostel has a modern and trendy vibe and there are great amenities for guests including flat screen televisions, free wi-fi, and balconies for some rooms. There are single, twin, double, and three bed private rooms to choose from. A charming hotel with a lot of character. Casa de Huespedes Dolcevita is a quaint place to stay in Madrid. It's located in a beautiful historic building that has a lot of character and charm. It has been recently restored in a way that maintains much of its old charm. There are seventeen rooms and 45 beds in total and guests can choose between twin, double, three bed, and four bed rooms. Each room has it's own sink, television, heating, and a ceiling fan. There is also wi-fi available throughout the guesthouse for free and breakfast is served every morning. This hotel offers very personalized service and a focus on the details. It's a very safe and clean place to stay with a friendly staff that are helpful and knowledgeable. The surrounding neighborhood has many great shops and a lively atmosphere.